Pam Montgomery is a lover of Lady Gaia and a spokes person for the green beings and their home base of Earth. For a decade, Pam was on the Executive Council of the Board of Directors of United Plant Savers, an organization dedicated to preservation of our native medicinal plants. Pam has organized the Green Nations Gathering, Spirit Healing Conference and the Healing With Flowers Conference. 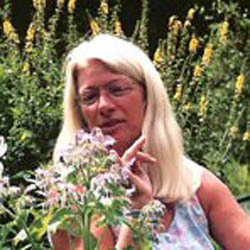 She teaches internationally on plant spirit healing, plant communication, spiritual ecology and the emerging nature renaissance. Pam has written two books, "Partner Earth; a Spiritual Ecology" and the best-selling,"Plant Spirit Healing; a Guide to Working with Plant Consciousness." Pam teaches a Plant Spirit Healing Apprenticeship both from her home, Sweetwater Sanctuary in Vermont, and in California. She offers long distance healing sessions designed to go directly to the source of one's compromise thus effecting a lasting change.